Plans for road improvements and the need for more affordable housing in Morrow County were shared topics when elected county officials met with the Morrow County Commissioners last week. Morrow County Auditor, Pat Davies commented that elected officials are looking for ways they can collaborate and cooperate between county departments and private business, as well as state agencies. She added that they are seeking to follow ‘best practices’ as they look at what other counties and villages are doing. They are working at communicating with each other both within Morrow County and with other counties and state agencies. County Engineer elect, Bart Dennison reported that he is working on establishing Morrow County as a ‘Transportation Improvement District’ (TID.) He said there are now 15-20 TIDs in the state which can use money allotted for roads. He said he will work with Morrow County Development Director, Shane Farnsworth and officials from Gallia County, which just recently became a TID. Dennison indicated that a possible TID project is the Twp. Rd. 225 near Heartland Conference and Retreat Center. He said he has received many requests to have the road paved, and it has many problems with cars blowing tires. The Engineer-elect said that his office is receiving many calls requesting pot hole and road repair since the roads levy passed. They are keeping notes on those calls and hope the citizens realize it will take some time to get to all that needs to be done. Other projects for county roads are continuing chip and seal and doing berms on roads already paved. The overpass on County Road 15 is to be shut down April 14 for a bridge replacement. Davies reported that sales taxes are still rising in the county. Sales have shown an increase year-to-year since 2013, and the first quarter in 2016 is already up 9.86 percent. Two projects the auditor’s office is working on are the Geographic Information System (GIS) Mapping and updating the standards for conveyance of real estate in the county. Davies said the GIS Mapping System is now up and running, but mostly used by the auditor’s office and the county engineer. It is their goal to prepare the GIS Mapping System for use by business, realtors and the public. Davies is also working with Dennison to update the standards governing conveyance of real property in Morrow County. That list of standards for real estate transfers has not been updated since May of 1996. Davies is pleased that the Dennison will be working on the updates since he had experience with that in Wyandot County where they recently updated their standards of conveyance. Recorder, Dixie Shinaberry said that business has been “extremely slow” the first quarter of 2016. She added that there just has not been the inventory of properties and homes as in the past. Income from fees is up slightly for the first quarter of 2016, but banks are more cautious and slower with real estate sales than in past years. Judge Howard Hall said that there are still many foreclosures coming through the courts. Judge Robert Hickson added that there is a great need for affordable, single family housing – especially with the growth in the southern part of the county. Both Hall and Hickson suggested that officials work together with Morrow County Job and Family Services or another agency to hire clerks, secretaries and other employees from within the county. Hickson said there needs to be a listing of available employment opportunities within the county to encourage both county employers and job seekers to look first in Morrow County. Sheriff Steve Brenneman reported that the jail is “unexpectedly running full.” Inmates are coming from Lawrence, Meigs and Jackson counties. Treasurer, Tom Griffith gave information about forming a Land Bank for the county to reclaim abandoned, vacant and foreclosed properties. Alberta Stojkovic | The Sentinel Bridge replacement is underway at the Co. Rd. 23 overpass of I 71. Work begins on the overpass on Co. Rd. 15 on April 14th. http://aimmedianetwork.com/wp-content/uploads/sites/29/2016/04/web1_DSCN8953.jpgAlberta Stojkovic | The Sentinel Bridge replacement is underway at the Co. Rd. 23 overpass of I 71. Work begins on the overpass on Co. Rd. 15 on April 14th. Alberta Stojkovic | The Sentinel Bridge replacement is underway at the County Road 23 overpass of I-71. Work begins on the overpass on County Road 15 on April 14.
http://aimmedianetwork.com/wp-content/uploads/sites/29/2016/04/web1_DSCN8951.jpgAlberta Stojkovic | The Sentinel Bridge replacement is underway at the County Road 23 overpass of I-71. 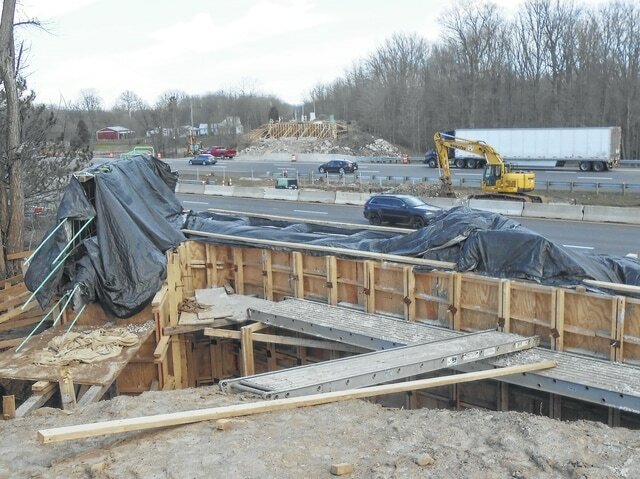 Work begins on the overpass on County Road 15 on April 14.